It’s time for another Cute Outfit Ideas of the Week! And I need a favor from you gals. Let’s make this one as popular as this one okay? (43,000 pins and counting.) Cool? Why is that? Because I’m in love with the tote and wallet I’m featuring in this week’s Cute Outfit Ideas. Serious love. 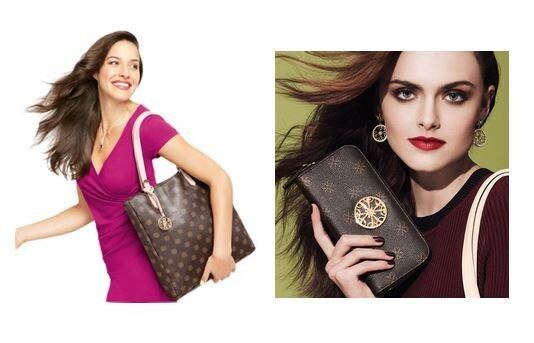 Feast your lovely eyes on AVON’s Mailyn Tote and Wallet. AVON just launched this brand new signature collection at the end of November, with plans of expanding the line in 2014 to include new handbag styles, jewelry and accessories. I like the sound of that! The new line features their iconic 4A monogram, which was featured on everything in the 1960s and 1970s. Do you know what their logo stands for? I didn’t, until now. Look closely at the logo and you’ll notice it’s made up of four A’s, which symbolize the dedicated Avon Representative motto, “Anytime, Anywhere, Always, Ask.” AVON dates back to 1886 when they were a California Perfume Company. I love hearing the history of a company and seeing where they are now. Now, about the Mailyn tote and wallet. It’s a rick chocolate brown color with gold tone hardware. There is a large zippered pocket inside and 2 smaller pockets as well. The closure is magnetic and is very easy to open and close. The wallet includes 6 slots for your credit card, an interior zippered compartment and zips closed to protect your valuables. I’ve been toting (pun totally intended) the tote and wallet around for a few weeks now and they both are extremely well made. I seem to be a little rough on my bags. Between constantly being on the go, in and out of the car and filling them with my things and my kids things – my bags go through a lot. This leatherlike tote has not been a disappointment and I absolutely love carrying it around. What else do I love about it? It goes well with both a casual outfit and a dressy one. Shall I show you? I thought you’d never ask! Here are two outfits I made featuring AVON’s new tote! Which outfit is your favorite? I can’t choose. I just can’t. I would wear them both! If this AVON Mailyn tote and wallet has you intrigued and you want one, like now, call an AVON representative if you know one. Or visit their website here. Disclosure: MomFabulous receives product to review. No other compensation was received. Please see my disclosure policy here. Next articleMenu Monday: How Do You Plan Your Meals?